Product Review Networks - Get paid $2000 Per Review! →Product Review Networks – Get paid $2000 Per Review! You cannot succeed as an Island. If you stand alone, you’re certainly going to need to put in a lot more effort. If you can make $1000/month as a blogger, join hands with many more bloggers and watch your income grow. If more people work had every month to give you $100 each, you end up making more than trying alone to make $1000/month. Think about it! 3 or more bloggers in a specific niche bring their blogs together to create advertising package or network. They all move out looking for advertisers to buy the package. Each time the package is bought by an advertiser, the buyer gains exposure on all the blogs present in the package. That is, everyone of you in the network will have to write a review for that client on your different blogs and share the price. It might not only be a product review business. You can also have specific banner slots sold in the network. This is crazy! I have seen blogs with 10 000 monthly visitors get paid $500 per review. If you guys can come together and offer this kind of exposure, I bet you, advertisers will rush for your network. 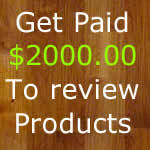 With a solid network, you can charge $2000 or more per review post. The idea is simple – you guys team up and hunt for business together. Instead of going round alone looking for someone to buy $50 banner space or pay you $75 to review his product, why not search for advertisers who can pay $500+ and get exposed on a whole network of blogs? You may not be able to get a customer that can pay up to $1000 per post on your blog. Similarly, it will be difficult to get 10 customers who pay you $100 each per month for review posts. On the other hand, it will be easier for you to get 2 clients to advertise on your network of 5 blogs with over 50 000 monthly readers, and if each of you in the group gets 2 customers, that will be winning the battle. Note that if you can put up this kind of huge traffic, getting business will not be the hard part any more. It is easy to start a network. First, define what you want – The categories of product you can accept to review on your blog. You have to make sure you focus on your readers’ interest first. The products you accept to review or publish on your blog must be relevant to your niche. If you are in the dog training niche, for instance, it will be senseless to review a gulf training product. Invite few friends in your niche. Let them know what you want and how you guys coming together can boost your earnings. For a start, I don’t recommend going beyond 5 blogs in your PRN. The bigger the network, the more difficult it is to manage. Work out a promotion strategy to attract advertisers. Share your social media strength – How many followers each of you have. How many list subscribers, etc. These are all factors that can influence the success of your network. The PRN page should be one of the most promoted pages on your different blogs and should contain enough information to attract business. This is where members in the network have to agree on some terms. If you are 5 in the network and you get a deal of $1000, you may share this equitably. You may (on the other hand) want to give a higher share to the blogger who brings the business or the blogger with the most popular blog. However, you can start a PRN and lay down your conditions. In any case, you have to understand it’s a business group where everyone should contributes to its growth. There are many platforms out there to help bloggers make money. However, I have not seen any of them that has effectively implemented this idea. Do you think developing such a platform is worth it? I’m PHP developer with skills to technically handle this kind of program but my hands are quite full now. If you a good developer and think we can work this out, contact me. Let me know what you think about the idea of creating product review networks. Share your views in the comment box. If you like this post, also share it on social media. Great Idea Bro ! , But How to Search Such Bloggers ? Where We Can Find Such People ? Enstine Muki recently posted…Product Review Networks – Get paid $2000 Per Review! In addition to Enstine’s response, your blogging friends provide an excellent starting point. It would be a great idea to start with those you already know and can vouch for…I have five in mind already! This is very terrific idea Enstine. Thanks for sharing this. Enstine Muki recently posted…Microweber ~ The Turnkey Opensource Website Builder! Enstine, your mind is a minefield of ideas! 🙂 and endless thanks for sharing them with us. This is a terrific idea. Just one doubt – Isn’t this idea similar to a private blog network? Isn’t such kind of advertisement against Google policies? If it is allowed to advertise on many different blogs at the same time, then this is clean. It is as simple as you and I deciding to collaborate and share profit. Rather than presenting just my blog to advertisers (who often ask me to recommend other blogs), I can present mine and yours. So instead of paying $100 to publish on my blog alone, he pays $200 or more so his product gets reviewed on 2 blogs. This is not like PBN too. It’s no link building attempt. It’s a profit sharing network. What do you think? Enstine Muki recently posted…Blog Traffic For Beginners ~ 1,000 visitors per day guaranteed! Again a great idea for creating the mass exposure for the advertising engaging bloggers is impressive idea. I lived it sir. Thank you for such nice idea and review tips for getting income for our self. This is really a cool idea. And only a blogger like you can come up with such kind of idea and even share with other bloggers too. This is really a cool idea Sir, will surely work on it and let you know the results. This is indeed an excellent idea, original and new. An advertiser will prefer to advertise on a network of blogs and it will be easier to convince anyone than when its done individually. Enstine sign me up for a spot if you have one already. I will be glad to work with you on this. Please can you contact me? Do you have skype? I will also contact you via Facebook so we can talk about this. Hey Enstine, This is such a Great Idea. Thanks so much for this post , keep it up sir and Have a great day ! It sounds like a good project to keep in mind. Thanks for sharing this post with us, my friend. Excellent way to earn money. But I have a doubt that where can we possibly find such potential advertisers who want to get their things advertised through such integrated blogging networks? Product Review Network ( PRN) is an awesome idea. Its a WIN WIN strategy for bloggers and and advertisers. I see that for this to work properly, there must be proper understanding for interested niche blogs. However, the grey areas of developing the platform and sharing revenue are to be clarified before going into PRN! PRN is revealing and I think it should be tried by bloggers who trust one another! That’s a great idea. What a single blog cannot achieve, group of bloggers can achieve the same in bigger way. Thanks for the post. But I have just moved my blog from blogger to self host with WordPress but when I read your post this morning it sparked off another idea on how to possibly use my old blog to work myself into a new niche possibly. I put the idea up on my blog and hope you’ll drop in when you have some time and advise on whether you think it could work from this perspective. here is the post link i mentioned. So you are back with yet another wonderful idea to make/generate great cash from product reviews. I guess I’ll have to go through the process completely. Just loved the idea.. I have more 30000 visitors per month kindly let me know when you guys are initiating this. Great! What about starting your own network? Great! Great!! Great!!! Idea Enstine. I love the way your brain works boss! I think this is cool and it will surely help a lot of bloggers out there to make money from their blogs. A Blog network will surely entice advertisers and make us all more money! Thumbs up for this Great Idea! I hope to see yours soon. I know you have a great blog and most bloggers will like to be part of your network. Why not I don’t mind.. Ill let you know when I got some good sponsored reviews. Great ideas Enstine… Yeah! This post really does makes sense.. Now it’s time to find interested bloggers.. Big ups to you Sir. You are just awesome Enstine. You always come up with awesome money making ideas. This time, i must say “it’s just amazing”. I will surely implement this. However, i have a doubt. Few months ago, Google penalized guest blogging network. Would it be safe to start such a network..? would love to know your response. Thanks for pointing our the typo. That error was corrected few minutes after publishing the post. I think I’ll need to clear my minify cache so you can see the corrected version. I never thought about such trick to earn money. Individually a blogger might be weak in attracting advertisers but with a group of many bloggers one can attract advertisers on a continuous basis. Product reviews are the best paying sponsored article, it is often available in the market. For this strategy to work one needs to honest as the payment needs to distributed equally. Thank you Enstine for sharing this brilliant idea. I kingged this article on kingged. This is an excellent idea. I am always looking at ways to increase revenue. Product reviews are great ways, there are many advertisers who would jump to advertise. And in this way not only you will have a free product but get paid at the same time. I am beginning my reviews shortly. Thanks for the idea. for 2 grand I’d even review Mark Cuban’s 1013 tax return, no doubt. I totally dig the idea of teamwork. If you get together you’ll do wonderful things. Appreciate it. Hey Ryan, Do you do product reviews on your blog? Amazing idea Enstine bro! How do you come up with such ideas? I’m not blogging consistently these days and updating it once for a month or bimonthly. So as the traffic and Alexa rank- declining everyday. It is great to form PRNs as it gain us money as well as content. The two things we should care if we do this are connecting with right people and reviewing right products. What do you think? A notice again to you: Your Commentluv plugin is not working! “You know advertisers want exposure so if we can team up to give them unthinkable exposure, they will give us the money.” this is a good takeaway and I have to agree with you. I like it since even though your blog don’t have much traffic, you can still get $2000.00 in reviewing a single product. That is very interesting! PRN or Product Review Networks is a very cool moneymaking tactic. Pretty sure, readers will search for advertisers who can pay $500+ and get exposed on a whole network of blogs. A guide here will help. Thanks for this! Awesome! Great Post Sir, Really Inspiring Me a Lot. Now I am going to Make a Team of bloggers and start getting product reviews. Thank you very much for sharing your knowledge, I hope that you will share many business ideas with us. This is a very good idea and the type that really need to give a shot. No doubt is coming out of the money blogger himself – Enstine. But first; before considering jumping on board in this king of program……..trust most be the first determinant factor that will ensure success and mutual understanding. And again, like you rightly pointed out in the article; all participating bloggers hands most be on deck and clean. Thanks Enstine, this is good and a very welcome idea. Are you thinking of working on this bro? Yes Enstine, I’m thinking about it but needs sometime to really look at things from different angle and perspectives. Will let you know when am done. What a marvelous idea! Unity, togetherness, team work and profit sharing are the unique progressive idea for the good business development. But, it is rightly brought out now, for the welfare of the world bloggers community. It is heard that advertisement budgets are not fully used around the world. You have great wonderful expertise on grabbing the deals. Please lead the PRN for building a kingdom of bloggers, direct them to divide the niche and lead the profit sharing. In my country, many young brains are remaining idle and not clear what to do next. Similarity may be from your country and other third world. Nowadays, as a common man, owning a two bed room house is a life time struggle and a for-away dream. Your money earning guides are great and letting a light in the heart of bloggers through right earning. Thank you for your awesome efforts and services. This is the post I am most please with since I started checking out your blog…the potential for such a system will blow off any serious blogger’s imagination. Presently, mine is already blown and I am currently thinking at the speed of light already. Expect some changes in the days to come. Sure, Enstine. When those changes happen (soon enough), I’ll definitely keep you in the know! Well everything seems fine and perfect but where to start, I think I don’t have any partners or a big list of blogs. Hi Estine, I must say that you have sparked a really great idea. I mean, there might be a possibility of rejection for a product review for a single blogger, but for a networked blogger, there is no chance for rejection of proposal. Prior to make such network, I must say the blog’s ranking also matters a lot for advertisers and product owners. Secondly, the similar niche is an additional advantage for great marketing for all the blogs in that network and for the advertisers too. AS you mentioned, the PRN’s landing page should contain valuable stats for all the blogs in the network to compel advertisers to offer you their review. Your idea is really a great one. Thanks for igniting the tip and sharing it on Kingged.com. This is an awesome idea! Man, you come up with some excellent ideas for sure. I am a believer in your method of working together and achieving more. Once you get the system up and running and worked out the kinks, you could offer the system to others to create there own networks!!!! I completely see your vision and know you can make this happen! I would love to say more but your post has my wheels spinning 🙂 I’ll just end with you’re the man! I’m already working with a few bloggers to put up our first PRN. I’m sure this will be a success. However, you don’t seem to do reviews on your blog, do you? hello enstine like always again you came up with a creative idea. Iam sure thatthis method would work. And like you said it won’t be very hard to get 2 or 3 customers eveery month. Great share mate and I can’t wait for your next post. I love doing creative ideas and I guess I’d surely try this cool method soon enough.